Intersection of SR 471 and CR 567 (aka: Fortune Teller Road; East of 471; Between Webster & Sumterville. Pilaklikaha was also known as “Abraham’s Old Town,” named after Abraham, who came to the area after escaping slavery in Pensacola around 1826. Abraham served as a skilled interpreter and the voice of the Seminoles during treaty negotiations with the United States government. He rose to prominence as the counselor for Chief Micanopy, even accompanying him on a diplomatic trip to Washington, D.C. Abraham was later released from service in appreciation for his work. Assuming a connection to the Dade Massacre in 1835, United States Army soldiers, under the command of Brigadier General Abraham Eustis, burned Pilaklikaha to the ground on March 30, 1836, during the second escalation of the Seminole War. All the residents of Abraham’s town escaped weeks before its destruction. 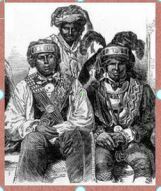 During the conflict, many native Seminoles and some Black Seminoles, including Abraham, were forcibly relocated to Indian Territory, in present-day Oklahoma, as part of the “Trail of Tears.” Abraham died in Indian Territory sometime after 1870.